Women, and especially queer women, have innate senses of empathy and strength, which politics currently lacks. We need more LGBTQ women in elective office. Why? Because these times call for courageous, unifying leaders who can fully represent the truth, diversity, and beauty of America. LGBTQ women are such leaders. Not long ago, the LGBTQ community — particularly its women — rejoiced. We could marry legally; our rights as full citizens seemed on their way to being recognized by legislatures across the country; we felt embraced by most Americans and in our families; and under our first African-American president, the country welcomed LGBTQ staff and communities into the national policy conversation as it never had before. The election of an administration that panders to the lowest common cultural denominator of its conservative base has turned that celebration into anger, as the LGBTQ community, communities of color, immigrant communities, and women of all backgrounds face the harsh and heavy hand of political retrenchment. President Trump has used his power to divide Americans against each other. Instead of lifting the voices of the weakest, he singles out the vulnerable for derision and petty vendettas. Instead of upholding the Constitution, he endorses the retro-policies of zealots — banning trans soldiers from the military, eliminating important antibullying protections from our schools, denying women's rights to control their own health decisions and taking away critical support for women’s health, and erasing the lives and contributions of LGBTQ Americans from federal websites. The president’s use of his considerable power to threaten and intimidate ordinary Americans who want nothing more than equal protection under the law and nothing less than respect and human dignity is turning into a massive black mark that I fear will be increasingly hard to erase. He is enabled in this by a Republican Congress, which is facilitating an un-American political agenda of repression and greed. Republican officials down the line — in state houses, governor’s mansions, and city councils — are falling in. The threats against our rights are real. This must stop. And we in the LGBTQ community — and anyone who shares our progressive values — must make it stop through our votes and voices in November of 2018. 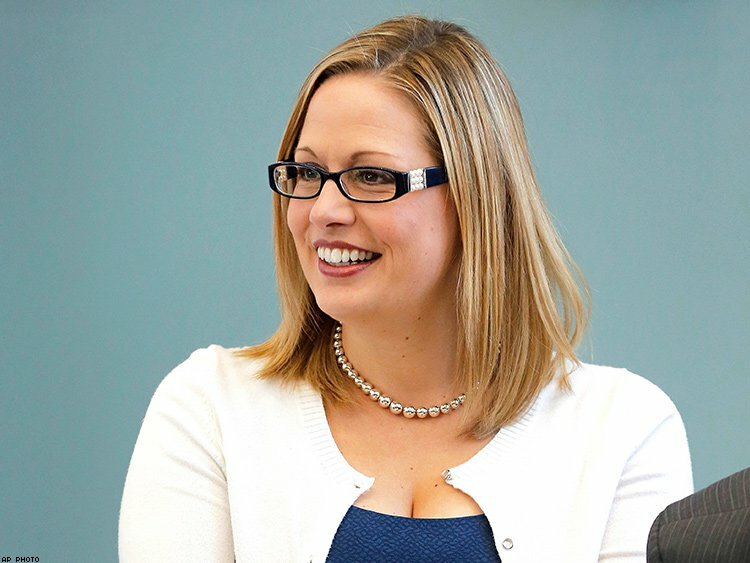 As part of a tidal wave of reform, lesbian, bisexual, and transgender women leaders are running for office across the country, with some 65 change-oriented candidates (including bisexual Senate candidate Kyrsten Sinema, above) of every background (like aspiring-Texas governor, Lupe Valdez) stepping up to lead. We need these leaders; they understand what it means to fight against the odds and represent the values and principles that make this country great. We need leaders who understand what it means to stand up to bullies, to advocate for the full mosaic that is the American electorate — leaders whose intersectional identities enable them to be broadly representational, and whose visibility alone begins to change culture. LGBTQ women are the leaders we need. Voters love them — they win 10 percent more of their races than gay men, according to the Victory Fund — and business data shows that women are generally more effective leaders than men. Think collaborative, thoughtful, strong and empathetic. LGBTQ women leaders bring those qualities to their intersectional leadership. They are uniquely suited through their life experience to represent and motivate a broad swath of communities. That is why each of the candidates LPAC has endorsed are themselves champions of the rights and dignity of all — of women, including their right to control their reproductive and sexual lives; of black and brown communities, including their freedom from policies that foster disparity and inequality; young people of all backgrounds, fighting for the freedom to be safe in schools from gun violence; the immigrant communities that helped make America great, fighting for their dignity and families; and people of all walks of lives, all races and backgrounds and genders who seek economic opportunity and well-being for themselves and their families. Simply electing people who are good on our issues is clearly not enough to keep a foothold on progress made — and help its effects to be implemented more broadly in our culture. We need to see champions of LGBTQ rights, gender, racial, and social justice — to see ourselves, elect ourselves, and support ourselves. That is our platform at LPAC and why I am stepping in as its new leader. Join us — your civil liberties depend on it. STEPHANIE SANDBERG is the executive director of LPAC, which works to elect LGBT women to political office. Follow her on Twitter @smsandberg.